Now, I'm sure that I'm not alone in this: I bet many of you are exploring your options and making adjustments to your skincare routines in an effort to prep your skin for the colder months! Well, if that's the case, we can do so together - the upcoming 2-3 weeks on here will be mostly skincare based, so if you're a skincare junkie, tune in for my reviews and ramblings! Yes, from what you can tell, things have become a little more complicated since my last skincare post, partly due to my curiosity for new products and partly due to some neccessary changes that had to be made. But, before I get on with the breakdown, let me just remind you that my skintype is combination meets acne prone meets slightly sensitive and that this is what works for me for the time being. 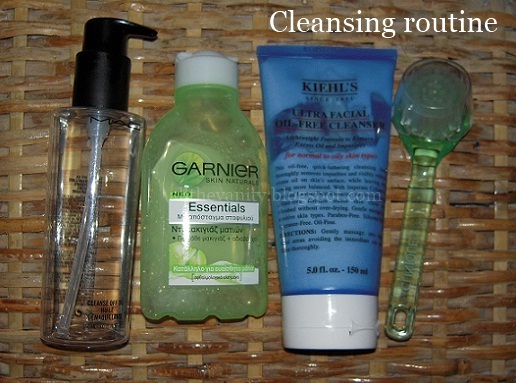 - I still rely on MAC Cleanse Off Oil to remove my makeup for the day. It works wonders and removes the slap without a lot of effort. It's truly an amazing product that I rarely go without (I part with it only when I'm traveling, in which case makeup remover wipes take its place). - I also still use the Garnier Essentials Eye Makeup Remover for my eyes, but I feel it's not cutting for me no more: I do appreciate that it's gentle to my eyes and that it doesn't leave an oily film afterwards, but I wish it did a better job at actually removing those persistent mascara layers! I'll definitely be looking into other eye makeup removers from now on! - After most of the makeup has been removed, I'll complete the cleansing phase with Kiehl's Ultra Facial Oil Free Cleanser. This is fairly new to my routine and an extremely pleasant surprise! It really removes the remaining impurities and oiliness, without being too harsh or too drying! Expect a review soon, as it deserves an entry of its own! - Whenever I feel that my skin needs an extra polish and while being inbetween scrubbing sessions, I'll use this Clinique face brush combined with my cleanser and dare I say, I think it works just as well, if not better! Probably something to do with the fact that it stimulates my skin, on top of gently removing the dead cells! I found this as a part of an old GWP bag that my mum had completely forgotten and decided to put it to good use. - I prep my skin with the Lancaster 365 Cellular Elixir serum first. I only use 3 small pumps for my whole face, since it's very liquidy. I know I was initially let down by it, but that's because I was probably using it for the wrong reasons: while it doesn't really remove any fine lines (and if it does, it's only minimal and takes numerous weeks to do so), it helps quite a lot with blemishes and uneveness (in conjuction to the Effaclar Duo I use at nighttime). I mostly use this as an extra protective layer against the daily damage from the atmosphere. - My moisturiser follows: the Malin + Goetz Vitamin E Face Moisturizer. Extremely happy with this one! I know it's not my trusted YSL Hydra Feel, but it's pretty darn close - minus the plumping abilities. It still moisturises effectively for a long period of time, it absorbs quickly and it doesn't interfere with foundation application. In fact, it's probably superior to the YSL one, in that it's over double the amount for half the money!!! - The Effaclar Duo Anti Imperfection treatment is a staple. I apply it on current breakouts or fading ones, depending on my needs. I need to say though, that it's the combination of this product with the Lancaster serum that I find tackles the breakouts quickly and effectively. On its own, I wasn't all that wowed! - Then, I use the Korres Quercetin & Oak Night Cream. I love this product and it actually delivers its anti-wrinkling claims. I don't use it every single night though, for fear of it being too heavy on my skin. It's more of an every 2 nights thing, or whenever I feel I need sth more than my Malin+Goetz moisturiser. - As for the eyes, I'm about to finish the Garnier Eye Roll On. The only thing I'm convinced it does, is battle the puffiness and that alone. However, I need sth for my dark circles too and this is definitely not it! Yet another aspect of my skincare that needs looking into! 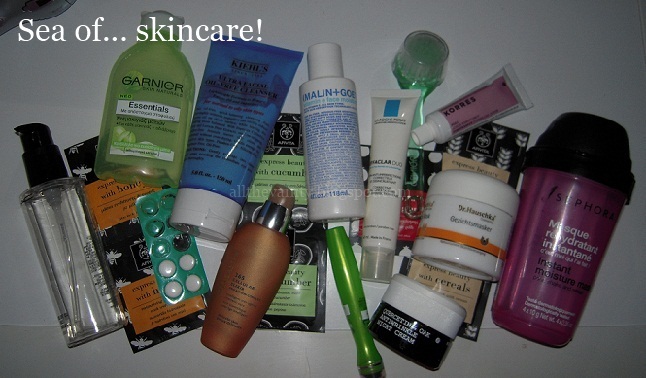 As far as weekly treatments go, such as masks, scrubs etc, I'll explore them on a future post. I wanted to focus on the core of my skincare on this one. As you can see, I've made a few changes since a few months ago, and while it seems more complicated, I feel it's more of a well-rounded routine right now, something not so easy for someone like me that has to deal with acne issues, as well as protective and anti-ageing aspects! 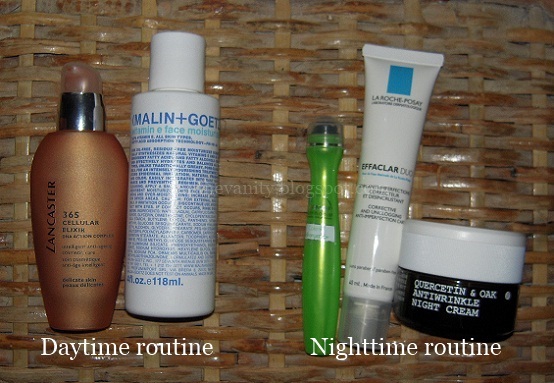 b. adjust quickly to your skin's needs: you don't have to follow the same exact routine every day and every night. Maybe you need to skip a step if you're too oily or add a step if you're too dry or you're breaking out more! Don't be afraid to mix things up! So, how do you figure out your skincare routine? What products do you use for your specific needs? Also, do you have any requests for future skincare posts? I love Korres products.. Their Wild Rose moisturizer is amazing! Feels so velvety and hydrating! Η αληθεια ειναι πως μετα το καλοκαιρι παντα ασχολουμαστε λιγο παραπανω με την επιδερμιδα μας..
Πολυ καλα φαινονται ολα τα προιοντα,θα τα εχω υποψιν μου..
Τωρα αν σου πω το δικο μου skincare..Πολυ minimal! I must get me a facial brush like the one you're using- I had a bad experience with those yellow face sponges and I'd like to try something different to use with my daily cleanser. Yeah, maybe I should blog about it, those buggers dried up my skin so bad! I had to google Malin+Goetz brand- easy skincare in a gorgeous packaging, I'm all for it! I love scin care products doll! !And your post inspiring indeed! !Havent try the night cream from Korres,it looks interesting and I have to get Kiehl's oil free range asap!!! I am actually trying to find a perfect skin care for my skin right now. Not sure what to choose yet. @LAURA*LOVES*MAKEUP: Yes, the Effaclar Duo does seem to help a bit more with spots than other products - it still does take some for me to see a difference though! @Artemi: Πραγματι, λιγο η εξτρα ενυδατωση που ειναι απαραιτητη μετα τις ζεστες, λιγο η προσπαθεια να διατηρηθει το μαυρισμα κ να αποφευχθει το...ξεφλουδισμα...ε, μετα ερχονται τα κρυα κ οι βροχες, οπως κ να το κανεις, χρειαζεται την περιποιηση του!!! Try and look for clinique sets on ebay (could be a 3 step gift with purchase, but I'm not sure), you might come across one that has the brush (and those go for dirt-cheap usually)! Just make sure that it's sealed ofc!!! Yeah, I think that the sponge was way too harsh for your skin! We need milder tools, that's for sure! @Blushingloves Irene Greece: Well I know u don't have any lines, but if you're at the pharmacy next time, ask for a Korres Quercetin&Oak sample, that thing bloody works!!! @Marina(Makeup4all): I know how it is, believe me it felt like a puzzle at times before I ended up with this...knowing what works or which ingredients and how long each product is active before you can layer sth else on top... it can be a pain! Great post! I also have kept up with the MAC Cleanse Off Oil in the past year or so and I've grown more fond of it over time. I just avoid using it to remove eye makeup since it leaves that weird blurry eye feeling right after :S I know you said you don't travel with it, but I actually find it really good to travel with. What wipes do you use in replace of the MAC Cleanse Off Oil when you travel? 2)your post has inspired me very much honey! That's a great post!!! I really need a change in my skincare regime as something is giving me pimples in that age! pfff..
@Karen Law: No, you're right, it is a great and fuss free product to travel with, but I want to avoid any possible messy leaking, which is why I opt for makeup wipes! I use Johnson&Johnson ones or some other affordable brand (would never buy anyth as expensive as MAC for example)! Thank you for the recommendation, I love the sound of that eye makeup remover!!! I've been experimenting a bit and so far the only other ones I've tried (sephora and MUFE) do leave an oily film (which might b ok for nighttime but not when you want a quick makeup f*ck up fixed)! Sounds like you've found a routine that works for you! And believe me, I know what a pain it is to have..tamperamental skin like ours!!! @Arietta: As far as I'm concerned, you're one of the most "iconic" of the real ppl, so that makes you timeless!!! No age talk pls (and its my bday in 3 days, so u get what I'm trying to say, haha)!!! That eye cream sounds great, I need to check that out! It's always hard to find a good eye cream, they're either too light and they wont do anything, or too thick and heavy!! !